SINN FÉIN’S PEADAR Tóibín has been suspended from the party for six months. Disciplinary proceedings had been initiated against the Meath TD, who broke ranks with his party’s policy by voting against the abortion legislation in the Dáil last month. As indicated by Sinn Féin party leader Mary Lou McDonald in April, Tóibín would face suspension from the party for doing so. Today, McDonald followed through on that promise, with the suspension of six months kicking in with immediate effect. 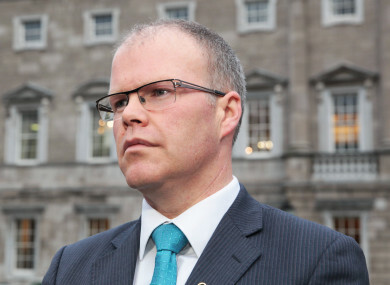 In a statement, the party said Sinn Féin’s Whip in the Dáil Aengus Ó Snodaigh announced Tóibín’s suspension for a period of six months “as a result of his breach of the party whip when he voted against the Health (Regulation of Termination of Pregnancy) Bill 2018 last week, in contradiction to the party’s position”. Ó Snodaigh said the proposed abortion legislation is in line with Sinn Féin’s policy position as agreed democratically at our Ard Fheis. The position has also been overwhelmingly endorsed by the people in May of this year.The party’s position on this legislation is to support it. The whip was in place and all TDs were instructed to be present and to vote for the legislation. Peadar Tóibín’s decision to vote against the legislation is a serious breach of the party’s rules and he has now been suspended for a period of six months. He has now been informed of the party’s decision. Speaking to TheJournal.ie today about his suspension, Tóibín raised concerns about the possibility he now not be able to run as a Sinn Féin candidate if there is an election in the next six months. “There is a significant chance of an election during the next six months. In the current political instability the suspension could become a de facto expulsion. It is my understanding that while on suspension I would be prevented from standing for Sinn Féin as a candidate and would not be allowed to re-enter the party subsequently if I seek re-election during the suspension. The six month suspension presents significant difficulties and uncertainty,” he said. I am a proud Meath man and believe passionately that Meath needs strong robust representation in the Dáil. I also believe strongly in economic justice and Irish Unity. It is hard to achieve this if I am being prevented from paying a full role in the Sinn Féin team. I will give serious consideration to this suspension over the next week. He previously told TheJournal.ie that the issue of abortion was “far more important than my job or any job in Leinster house”. The first vote on the Termination of Pregnancy Bill passed in the Dáil last month by 102 votes to 12. A number of TDs, who campaigned for a No vote in May’s referendum, voted against the Bill, including Tóibín. Following the news that disciplinary proceedings were being taken against him, he said that he has been a member of Sinn Féin for 21 years. He said he will seek to amend the abortion legislation at Committee and Report stage next week, stating that it is important to note that the 34% of the population that voted to retain the Eighth Amendment plus the 20% of Yes voters who don’t agree with this Bill should have a voice in the Oireachtas. “It is reasonable that TDs should give voice to the opposing views on Simon Harris’ Abortion Bill in roughly the proportion that exists in society. There is no better way to push voters to the extreme than to deny them a legitimate democratic voice,” he said. Email “Peadar Tóibín suspended from Sinn Féin for six months for voting against abortion legislation”. Feedback on “Peadar Tóibín suspended from Sinn Féin for six months for voting against abortion legislation”.